Rio’s Summer Olympics are just a few months away, and it’s not looking good for the city. The water is still polluted, stadium budgets have been slashed, and a scary virus is frightening athletes and spectators. Now, there’s also growing concern that the Games will be a financial disaster—and the poorest areas of Rio will bear the brunt of this failure. In many ways, the looming Olympic Games have already transformed Rio’s favelas, the city’s informal settlements that serve as home to a quarter of the city’s residents. Even though these neighborhoods face extreme poverty and often lack basic city services, over the last few years the favelas have almost been fetishized in pop culture—there’s a big installation in the Providência favela by the famous street artist JR, for example. (There’s also that movie, City of God.) Guides now regularly lead groups of tourists through the favelas, and that burst of foreign tourism, buoyed by the global attention around the Games, has created some economic stability. This has largely been enabled by a new network of cable cars that serve as a kind of Disneyland-like ride, delivering tourists directly to the heart of these communities. Rio’s future—and the livelihood of its poorest residents—is dependent on all these tourists showing up and shelling out. That’s a bizarre narrative to unpack as it is, but it has been made even more complicated by the two major sporting events which have happened in close—some say too close—succession, the 2014 World Cup and the 2016 Olympics. 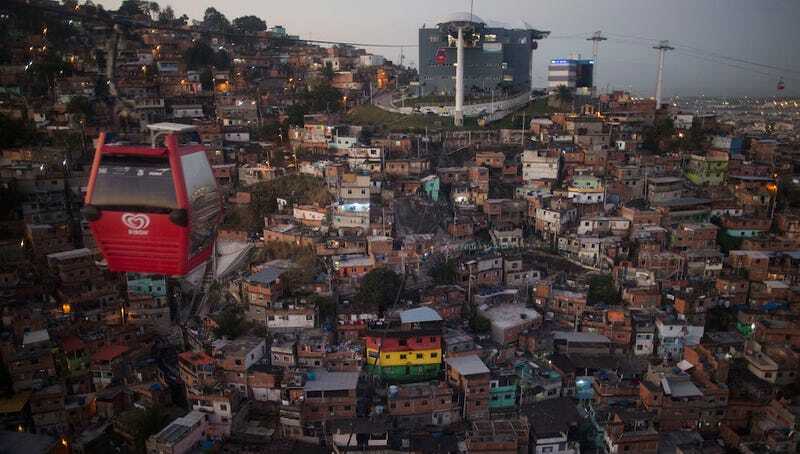 In a frighteningly mismanaged attempt to get Rio ready for these global spectacles, the favelas have also suffered, resulting in dystopian visions of people being driven from their homes, vicious protests, bulldozed neighborhoods and cranes hovering over half-finished venues. Although only one neighborhood has been “officially” relocated for the Olympics—Vila Autódromo, which sat on the edge of the city’s Olympic Park—there have been plenty of unofficial slum-clearance programs. In addition, the city has reportedly moved 22,059 more families since 2009 to build other projects which are just as essential to hosting the games, like new rail connections, airport improvements, bridges, and even sewers. You could argue that big infrastructural improvements will benefit the city after the Games leave, but it’s clear that these benefits are not equally distributed. Some neighborhoods might have gotten a shiny new transit line, but a place like Providência still doesn’t have running water. What might happen after the Olympic spotlight shifts elsewhere is also very disturbing. One of the biggest rumors is that with the crush of tourists gone, the city will stop operating those free cable cars that now serve many of the lowest-income communities. This would be a double-whammy: The reliable transportation that connects these residents to jobs and schools will disappear, and so will the easy access for tourists. Even more worrisome is that due to Zika, concerns about crime, calls for countries to boycott, and all the bad press, tickets to the Games just aren’t selling. Of course, you might say, the Olympics are rarely profitable. But the difference here is that Rio’s economic situation was very bad before the Games came to town. The city is relying on all these foreign dollars to help cover its billions of dollars in investments. Rio’s future—and the livelihood of its poorest residents—is dependent on all these tourists showing up and shelling out. It’s the most evil part of the Olympics, and we’ve seen it all before. The city is being ruined by the Games. But at this point, not having a successful, well-attended Games would actually be the worst-possible scenario for Rio.